Designed and manufactured to the highest standards, Kasp locks are renowned throughout the industry for being locks you can trust. As part of its ongoing strategy, Carl Kammerling International is keen to help its customers maximise sales and its latest introduction, the Kasp Starter Display, is no exception, offering the perfect solution for new customers to put sales of locks to the test. This eye-catching at-a-glance Starter Display includes a great range of Kasp best selling locks, covering all basic requirements and designed to help consumers choose their product quickly and easily. The new Kasp Starter Display includes a great range of locks offering a choice through three different colour coded security levels (low, medium and high). 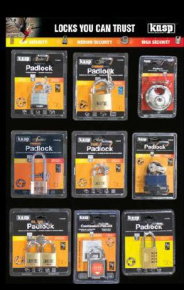 Based on Kasp best sellers, the Kasp Starter Display offers consumers some great premium padlocks, ideal for a wide range of tasks. These include: Combination; Weatherproof; Long Shackle; Keyed Alike; Laminated; Premium Brass; 160 Disc; Harsh Environment; and Heavy Duty Combi padlocks. The display itself includes a gloss highlighter card (680mm x 450mm), which provides a smart backing to hold the range together and create maximum impact in-store. The card is ideal for placing on an existing retail display, hanging perfectly on wide and narrow slat and pegboard displays. The display card also highlights the three levels of security to help consumers select the lock that is best suited to their needs. The Kasp Starter Display is available as a single purchase item (£254) and is also included within the Hotbox 18 promotion, offered at a very attractive price – call us for more details. For more information about Kasp products please call 01758 704704 or visit www.carlkammerling.com.